The island of Little Ross was unknown to most people until 1960 when a murder in the lighthouse buildings brought it widespread notoriety, to the grief and consternation of all who were involved. David R Collin examines how 117 years of devotion to duty, peacefulness and calm, was disrupted forever by a day of inexplicable violence, and reveals how he found himself at the heart of the island’s unusual and disturbing story. The writing of Life and Death on Little Ross was inspired initially by a tragic event which occurred 57 years ago, when I was nearly 20 years of age. 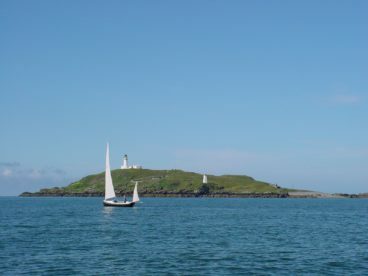 My late father and I had sailed to Little Ross Island in South West Scotland, close to our home in Kirkcudbright, intending to spend a few hours there for a picnic lunch and then to return homewards in the late afternoon. Our day did not go as planned, for on that remote and beautiful island, we discovered the body of one of the two keepers who manned the lighthouse, and noted the absence of the other keeper. It later turned out that we had discovered not merely a tragedy, but a mystery which was soon revealed to be a murder. The missing lighthouse keeper had shot his colleague in the head while he slept, and had then fled. 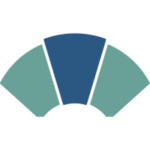 He was soon arrested and charged with murder, and we later had to give evidence at his trial, which resulted in him being sentenced to death. 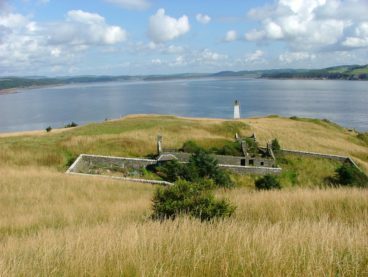 The dramatic and romantic setting of the island, combined with public fascination about the lives of lighthouse keepers made this a story, widely reported all over the world, with varying degrees of accuracy. I have often been asked to tell my story, and the frequency of requests increased sharply after the recent 50th anniversary of the event. It is sad for me to realise that I am now one of very few people, or possibly the only one, left alive who played a key role in the events of that day in 1960. Concerned by the lurid press accounts of the time, I resolved to investigate the entire history of Little Ross Island, and to tell the complex story of the case for there being a lighthouse on it, the struggle to gain its approval, and its design and construction. 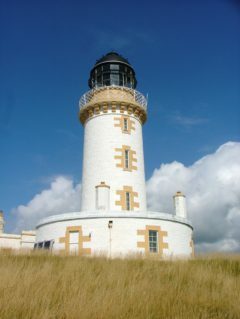 Many hours were spent in the Stewartry Museum in Kirkcudbright, The National Library and the National Archives in Edinburgh, delving into, among other things, the records of the Stevenson family who were responsible to the Northern Lighthouse Board for the lighthouse’s design and construction. I particularly wanted to describe the lives of all the peaceful and law-abiding keepers and their families who had lived on the island for 117 years and to tell their stories. The resulting tale is predominantly one of romance, dedication to duty, resilience in times of hardship, tenacity in providing good and comfortable homes for generations of children who were born on the island, and observation of the island’s wildlife. All of the former lighthouse keepers have been identified, some have left diaries and articles which have been quoted, and a few people have given invaluable first-hand accounts of their time spent living on the Island. The task of writing my book had been completed and my publisher was making excellent progress with its production, when to my great surprise, the owner of the private 29 acre island of Little Ross decided to offer it for sale. 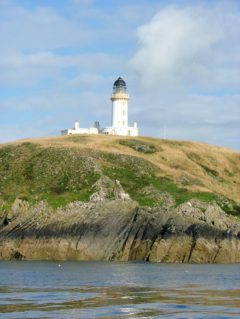 The prospect of being able to acquire a private Scottish island for a relatively modest sum of money was given widespread publicity by the press, and when reporters made the link to the past tragedy, the story spread like wildfire to nearly two generations of people who were too young to remember it in its original form. For the second time in its long history, Little Ross Island became a prominent story in newspapers in many parts of the world. The island and I both featured on BBC Radio and Television News programmes in the UK and also on French television. The story this time round was slightly different, and writers focussed on speculation that the island’s price was low because it was unlikely to sell, due to a totally unfounded theory that it was a desolate and creepy place, haunted by the ghost of the murdered relief keeper, Hugh Clark. Friends and colleagues of Hugh have subsequently told me that if he was to have had a ghost, it would have been gentle, kind and friendly like him, so there would have been nothing to fear. Prospective buyers seemed undeterred by the lurid tales of a grisly and gruesome murder, and over one thousand expressions of interest were reportedly made to the vendor, from people in the UK, France and Switzerland. At the time of writing, an offer well in excess of the asking price has been accepted, and the people of Kirkcudbright and its surrounding area eagerly hope that their favourite island has found sympathetic and caring owners. I am pleased to have had so much unforeseen advance publicity, and hope that readers will enjoy my attempt to introduce some balance to the remarkable story of Life and Death on Little Ross. Life and Death on Little Ross: The Story of an Island, a Lighthouse and its Keepers by David R Collin is published in November by Whittles priced £18.99.